Typical set-up for single-cell electrophysiology. Cells are plated in a flow chamber placed onto the stage of an inverted microscope (left). 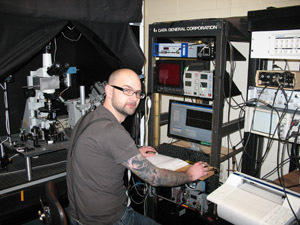 Micromanipulators are used to position the recording electrodes and the local perfusion manifolds. Instruments for electrical and optical stimulation and recording (amplifiers, oscilloscope, etc.) are on the right. The research in several of the laboratories in the Department makes extensive use of single-cell electrophysiological methods. The scope ranges from utilizing electrical recording to monitor specific cellular processes, to the investigation of ion channel mechanisms per se. Techniques in use in the various laboratories include suction electrode recording, ion-selective microelectrodes, voltammetry, voltage-clamping, and the various modalities of patch-clamp recording, including whole-cell and single-channel current measurements. These are often combined with rapid superfusion, intracellular dialysis, and ion measurements by means of fluorescent indicators and optical recording. Among the areas in which such approaches are being applied are sensory transduction and adaptation in photoreceptor cells, transport of neurotransmitter molecules in brain neurons, and calcium mobilization and regulation. Ionic currents measured in a cultured human retinoblastoma cell. The cartoon on the left illustrates the recording configuration. On the right, the bottom traces show the applied stimulating voltage steps of increasing amplitude, whereas the superimposed family of membrane current traces elicited by the depolarization is shown on the top.